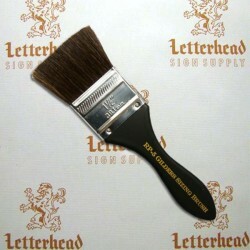 Buy a Water Sizing Brushes for sale here. This Water Size Brushes are designed for reverse glass gilding (mirroring) with loose leaf for signage, art decoration and much more. 100% pure Squirrel hair, wrapped with a stainless steel ferrule and attached to the handle with stainless steel nails. The handle is made from wood and painted black. The handle also has a hanging hole.